This genus is accepted, and its native range is W. Central Tropical Africa. Annual. 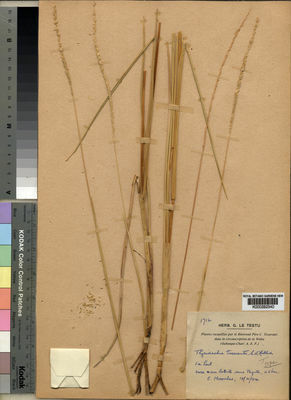 Culms erect; 30-70 cm long; spongy. Ligule an eciliate membrane. Leaf-blades stiff. Leaf-blade apex pungent. Inflorescence a panicle. Panicle spiciform. Spikelets solitary. Fertile spikelets pedicelled. Pedicels filiform; tip discoid. Spikelets comprising 1 basal sterile florets; 1 fertile florets; without rhachilla extension. 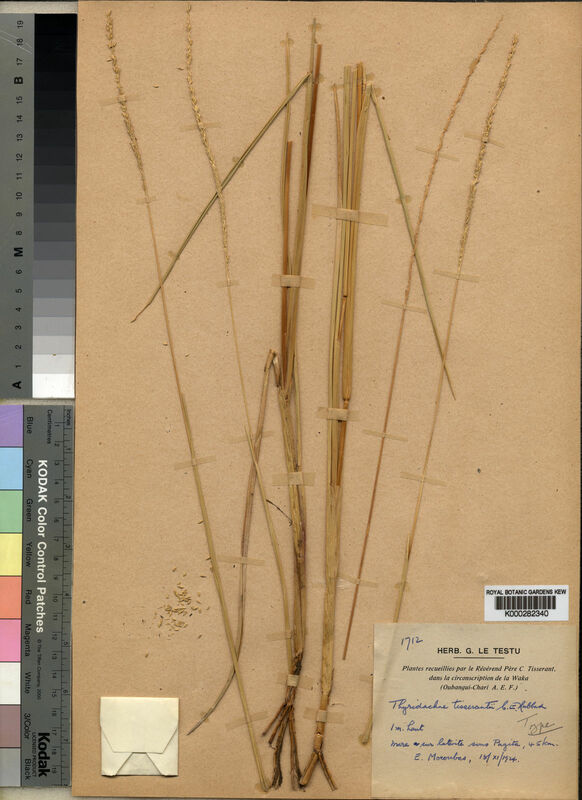 Spikelets lanceolate; dorsally compressed; gibbous; 3-4 mm long; falling entire. Glumes exceeding apex of florets; firmer than fertile lemma. Lower glume oblate; clasping; hyaline; without keels; 0 -veined. Lower glume lateral veins absent. Lower glume apex obtuse. Upper glume ovate; gibbous; coriaceous; without keels; 5 -veined. Upper glume apex acute. Basal sterile florets male; with palea. Lemma of lower sterile floret ovate; coriaceous; 5 -veined; readily splitting into two halves; acute. Fertile lemma elliptic; cartilaginous; without keel; 3 -veined. Lemma apex acuminate. Palea cartilaginous.